Newcastle Vikings’ mixed Junior team invited Churchill Community College to a friendly match on Wednesday 4th March at Percy Hedley Sports Academy. 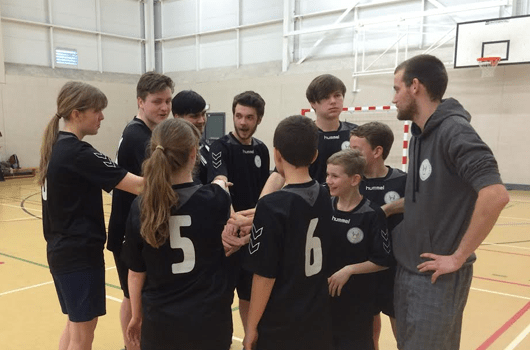 This was the first match of the season for the home team and the guests from Churchill had only had a few sessions of handball beforehand, so it was an exciting occasion for both sides. The Vikings started off the match with two superb goals in the first five minutes by their back court players, Jamie Clark and James Porter. The guests hit back quickly with a well placed goal by Karl, one of their key players. His team mate and captain Millie followed that up with another well taken score, quickly breaking through the Vikings defence. With the scores level the Vikings closed the gaps and formed a solid defence for the rest of the half. Charlie Pears joined the two other back court players on the score sheet just before half time and the Vikings went into the break 7-2 up. After the team-talks Churchill came back stronger in defence, determined to make it more tricky for the Vikings players to hit the back of the net. But Rebecca Johnson, along with Jamie and James, managed to score four more goals between them. The goalkeepers from both sides performed very well, especially the Vikings’ new addition Matthew Fairgrieve. Together with the rest of his team he managed to stop the guests from scoring throughout the entire second half. When the whistle blew at full time the score stood 11 – 2 to the Junior Vikings. The game was played with a great team spirit from both sides. Newcastle Vikings Mixed Junior team would like to say thank you to Churchill Community College for giving them a chance to play handball matches. The junior team hope Churchill would like to play more friendlies in the future. Next Post:Women’s match v NEM Hawks cancelled!